Before creating an Outbound Integration, ensure there is a JIRA Inbound Integration. 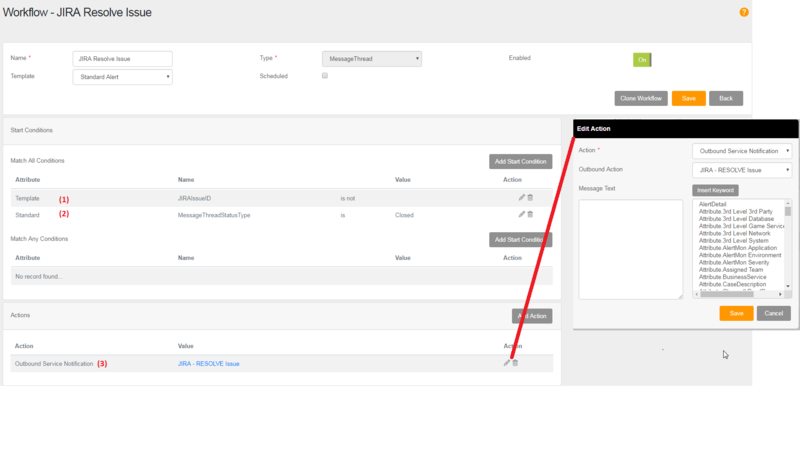 To do this, we expand the Integrations menu and select Outbound Integrations, then press Add Outbound Integration. We will now create the Workflows that will apply the Outbound Integration. For each workflow, select Workflow from the Menu and press Add Workflow. 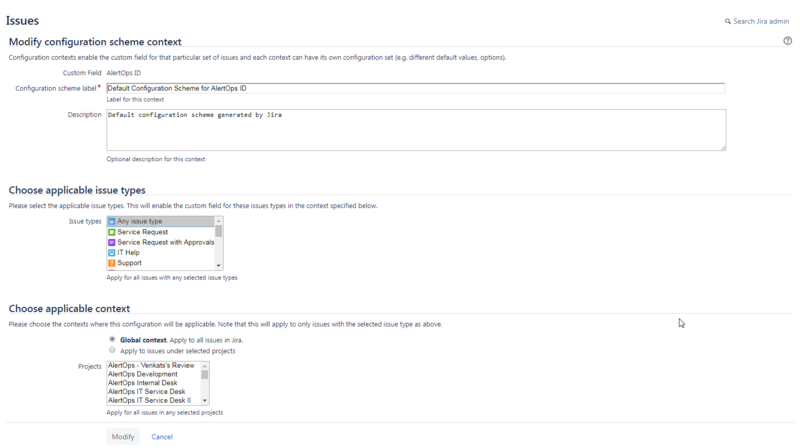 Template: choose the Template where the custom JIRA fields were added (above). JIRAIssueID (Template field) is blank (prevent creating a duplicate issue in JIRA). MessageThreadTimeFromBeginning is 1 (Workflow do not fire when an alert is first created, minimum wait time is 1 minute). Workflow Action is Outbound Service Notification – JIRA Create Issue. Press Enable in the top right of the window, then Save. JIRAIssueID IS NOT empty (only close if we have JIRAIssueID). Workflow Action is Outbound Service Notification – JIRA Resolve Issue. You can add comments or notes to a JIRA Issue. MessageThreadStatusType is Assigned (fires on assignment). Workflow Action is Outbound Service Notification – JIRA Add Issue Comment. 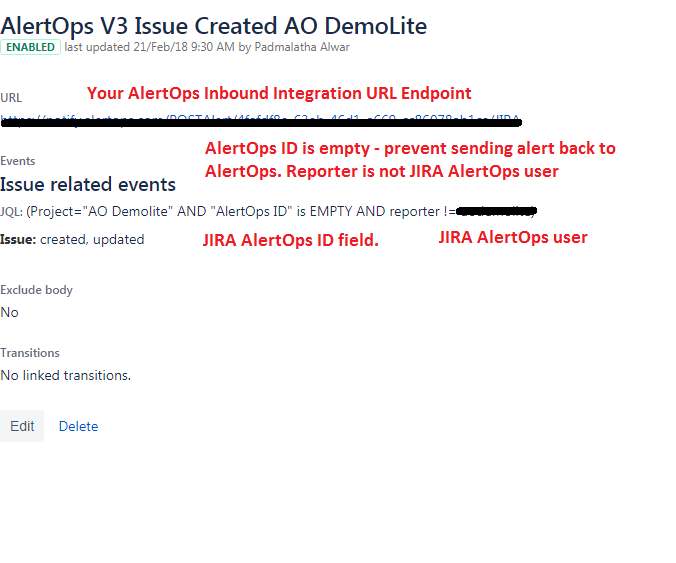 If you are implementing two-way integrations (creating JIRA Issues from AlertOps and creating AlertOps Alerts from JIRA), you must include the AlertOps ID field in your JIRA implementation and also include the filter in your JIRA Business Rule. Add a custom field to JIRA for the AlertOps ID. Issue Type(s): Global (all issues), or choose a specific JIRA template. The Webhooks for close and open use the same Inbound Integration endpoint. AlertOps may route requests to and endpoint to different (cloned) integrations. 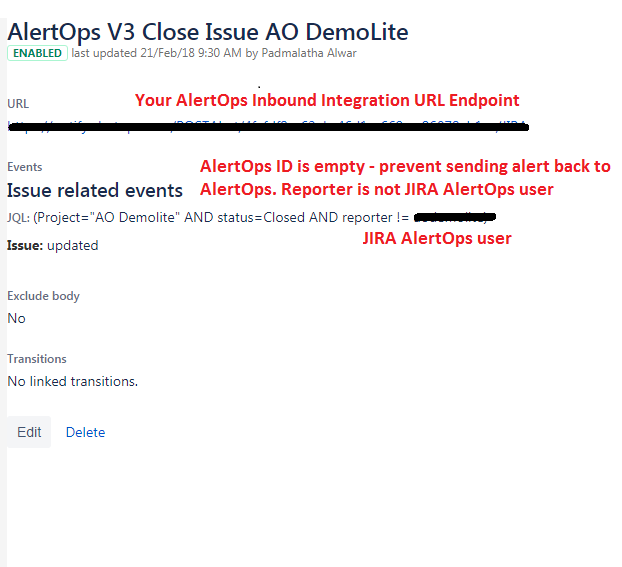 The status value in the JIRA request to AlertOps tells AlertOps which action must be done.